Named for the forest in southern England, where this breed originated, the New Forest pony is one of the recognized breeds of mountain and moorland ponies of the British Isles. They are noted for intelligence, strength, versatility and a quiet, willing-to-please temperament. Of all the native British pony breeds, New Foresters are the least afraid of man. New Forest ponies range -in size up to 14.2 hh and while there's no official lower limit, they seldom go below 12 hh. 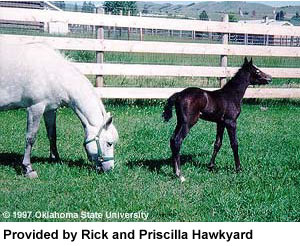 Bay, brown and grey are the most prominent colors and chestnuts, roans and blacks are also seen. Limited white markings are allowed on the head and legs. (Blue-eyed cream, piebalds and skewbalds are not permitted). The well-bred New Forester displays free, straight movement, plenty of bone, strong quarters, good depth of body and must be of riding type with substance. Suited to a kaleidoscope of activities from Pony Club, to Polo-Driving to Dressage, they're naturals at jumping and gymkhana and are successfully trained to carry handicapped riders. The New Forest ponies' most endearing quality is their inbred, gentle. 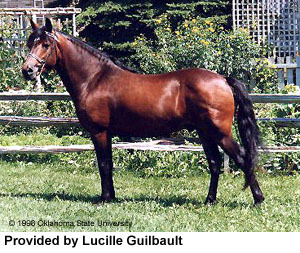 And while their calm dispositions naturally recommend them as an excellent choice for children, their sturdy conformation makes them suitable for light adults to ride, as well - the ideal riding, and driving pony for the whole family. 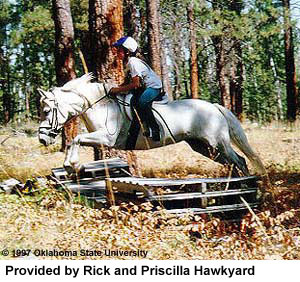 Cheval de Bois, Rick and Priscilla Hawkyard, Hamilton, MT.